The global nature of the automotive industry today means any change to its supply chain could be detrimental to all. As the U.S. government rolled out additional tariffs on imported goods from some of its important trading partners, auto companies in Michigan are losing sleep over trade fears. Industry insiders and experts said the Trump administration's tariff plan, which shows U.S. misconception about world trade, will certainly lead to a lose-lose situation. In its second-quarter earnings report released in July, General Motors cut its profit outlook for the year, citing significant increases in commodity costs. The automaker now expects to achieve earnings per diluted share of $6 for the whole year, down from its previous forecast of $6.3 to $6.6. Its rival Ford Motor Co. has seen commodity costs rising $300 million from last year, attributing about half of that to the U.S. tariffs on steel and aluminum. The tariffs are expected to eat up about $600 million in profit in 2018, the automaker's Chief Financial Officer Bob Shanks told media earlier. Fiat Chrysler, along with its German, Japanese and South Korean competitors, have all voiced their concerns about potential impact additional tariffs on steel, aluminum, and other intermediate goods could bring to the industry. Auto parts suppliers have already taken the fall. Henniges Automotive, which produces automotive sealing, said they've already seen cost rising. Lucerne International, which fabricates auto parts in its Asian plants and ship them back to the United States, is worried that the company's profit margin is too thin to offset the rise of costs. Like Lucerne International, many auto parts suppliers that are locked in long-term contracts with its clients will not be able to pass on higher costs. There are few ways for them to lower costs and break even. The companies will then be caught in a dilemma: whether to cling on to major clients running at a loss, or to stop loss by terminating partnership. Either way the companies will suffer heavily. Other suppliers may pass the higher costs to automakers, which will lead to higher prices of certain car models. "In the end, everybody loses," said Shuo Wang, president of Michigan-based automotive supplier STEC USA, a subsidiary of Shanghai-based automaker SAIC Motor Corporation Limited. One of the Trump administration's intentions to add tariffs on autos, auto parts, steel and aluminum is to bring manufacturing back to the United States and revive jobs. However, experts said the idea shows U.S. misconception about world trade. Farok J. Contractor, a professor in Rutgers Business School's management and global business department, said that while jobs will be preserved for a while against international competition in industries such as steel, winning back those already gone is difficult because global value chains take time to be reshaped. He pointed out the fact that U.S. workers are losing many jobs because of automation rather than outsourcing. Statistics show that for every U.S. job lost through international outsourcing, three jobs are lost because of automation. "It makes sense that American firms would prefer automation to outsourcing given the relative strength and size of the workforce in the United States," said an article from the Harvard Political Review published in July. Globalization and international trade are not to be blamed entirely for the loss of jobs in the United States, said the professor, whose conclusion is most evident in the automotive industry. As automakers expand their global footprint to reach the widest consumers possible, they are inclined to choose suppliers that could provide them auto parts globally in order to manage cost and quality. The inherent requirement for auto parts suppliers is to go global with automakers. STEC opened a plant in Madison Heights, Michigan in 2014 to stay as close to its customers as possible, marking another step in its global expansion. The Chinese company has a global workforce of more than 6,000 serving more than 50 customers in every major region of the world. STEC USA has since employed 15 U.S. locals and is aiming to hire more than 10 times that figure. 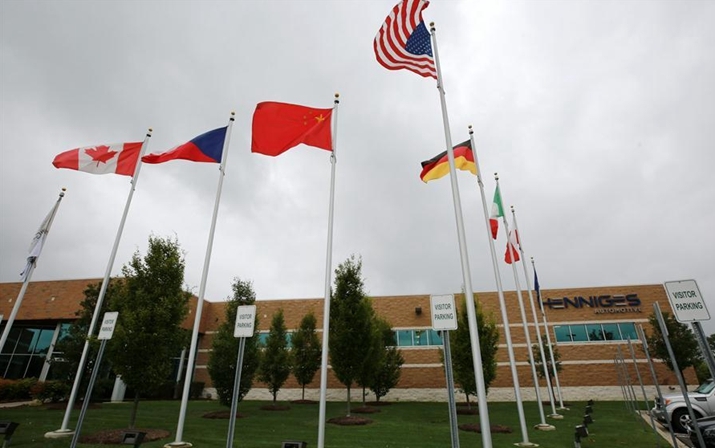 At Henniges' headquarters in Auburn Hills, Michigan, Chinese national flag stood high in front of the building, alongside those of the United States, Mexico, Germany, and many more, showcasing the company's global presence. In 2015, the company was bought by the Aviation Industry Corporation of China. Larry Williams, the president of Henniges, said the change of ownership allowed the auto parts supplier to adopt a long-term development goal and grow at a much quicker pace. The capital investment provided the company with an opportunity to expand abroad and add jobs at its U.S. facilities. Williams said that Henniges added three new plants in the past two and a half years under the current ownership, compared with two new plants added in more than a decade when the company was under the previous ownership. Many similar stories could be told by auto companies in Michigan and beyond, where the stronger-than-ever foreign presence has brought benefits to U.S. companies, workers and consumers alike. The Office of the United States Trade Representative (USTR) is holding public hearings on August 20-24, and on August 27, regarding proposed tariffs on approximately $200 billion worth of Chinese products. According to the USTR, the proposed tariffs are a supplemental action in response to China's unfair trade practices related to technology transfer, intellectual property, and innovation, based on findings in its investigation of China under Section 301 of the Trade Act of 1974. Williams said the accusation runs contrary to his observation. "There's a lot of sharing (of technology between Chinese companies and European or U.S. companies) that goes on, which creates some competition but ultimately improves the environment," said Williams. Representatives of the U.S. auto industry are expected to voice concerns or opposition to the proposed tariff list.